Hello Willa fans! We deeply apologize on the delay of these screen captures but here they are! 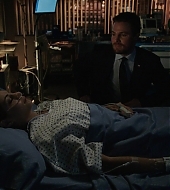 In case you are not aware, Thea has (finally) woken up from her coma in last week’s episode of Arrow! How much have you guys missed seeing Willa on your screen? We know we have, and we sure hope to see more of Thea from now on as she surely deserves a good storyline after all the hell she went through. High definition screen captures have been added to our gallery!